CAPE BRETON, N.S. — It had been about 90 minutes, a third of that in the rain. Trevor had gone on ahead. I was stumbling along with a significant limp. Melani was carrying sound-asleep Jilly like a sacrificial lamb. Maybe that wasn’t fair. I mean, most walks through the forest don’t culminate in a vista so grand no camera can capture it and no words can describe it. But the truth is, we’ve walked in lovely forests in Quebec and they have a lot more in common with this trail than one might imagine. We were interested in the other virtues of Cape Breton, like cliffs and whales and waves and islands jutting out of the sea. Those things Highlands National Park has aplenty … just not so much on the seven-kilometre Skyline, which is advertised as Nova Scotia’s premier hiking trail. But don’t let my forest-jaded self discourage you. Highlands Park is one of the most beautiful places on Earth and has dozens on dozens of trails to discover, over bog and along high beaches as well as through thick woods with a myriad shades of green. Even if you never leave the car, you’ll see the most spectacular sights from winding avenues twisting over French Mountain, past Jigging Cove and through Lone Sheiling. It takes at least two and a half hours to drive the entire route from Cheticamp to Ingonish, through towns with captivating names like Cape North, Dingwall and the elusive Meat Cove (ask me about the drive to that place sometime). There are hundreds of species of animals throughout the park, which covers a sweeping 950 square kilometres, at least six salt- and freshwater beaches, and Acadian, Boreal and Taiga habitats. There are layers on layers of history here, from the beginning of earth through a time when the land was owned by no one but home to a few brave people, to the settling of the Europeans to we slightly grumpy tourists and gawkers who come to swallow as much beauty as we can before returning to our two-dimensional lives. 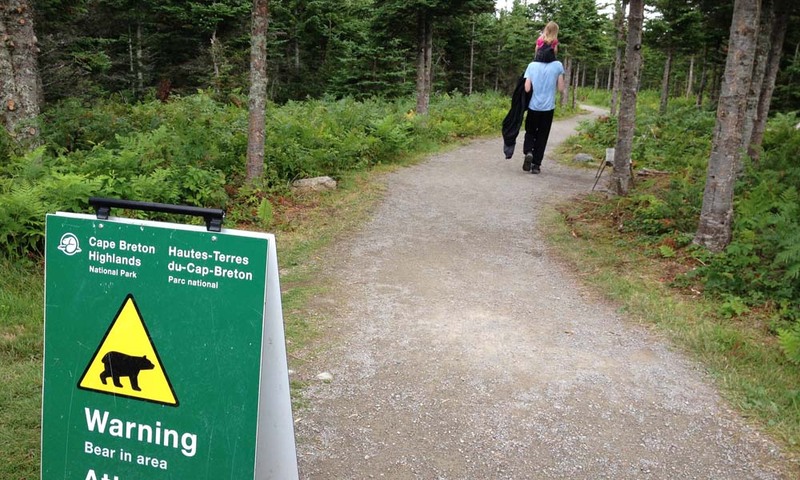 Despite the weather and what I consider to be a poor choice in walking trails, Cape Breton Highlands National Park gets four out of five stroller wheels. The paths were clear and flat and an easy walk, even though they passed through forest and over a mountain. And—oh!—everyone we met had a smile and a “hello,” which you just don’t get as often at home. 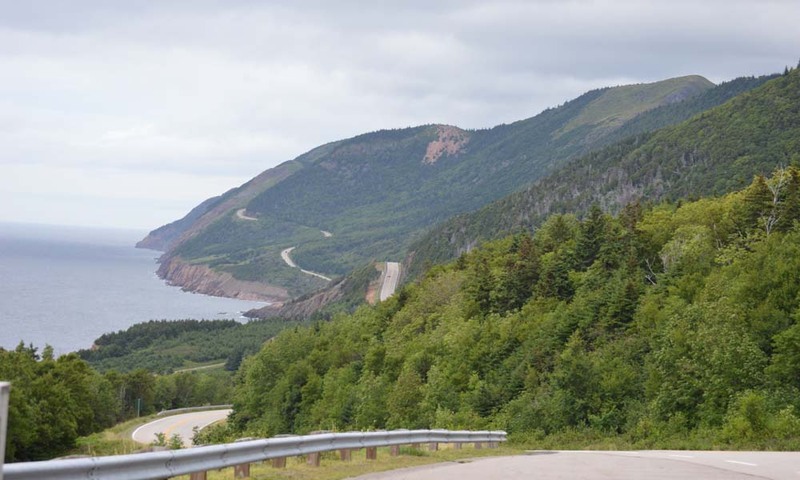 The road from Cheticamp to Ingonish Beach is 170 kilometres, but mind that much of that is on mountain roads—you’ll have to gear down to get up and down those ancient hills safely. A park pass must be purchased between May and October. Prices range from $3.90 for youth to $19.60 for a family for a day pass. But consider purchasing the annual family pass, which will run you $98.10 and is accepted at dozens of attractions across the country.